Tamiko Rakujochigusa is the most recent in the line of kunoichi, or highly skilled female assassins, to bear the title "Sakura". Her clan of warriors are reputed for making specialized blades that incorporate each metallurgical advance since the 18th century. The ultimate warrior, Sakura strikes with legendary grace, tearing her opponents apart with special blades called konohana-no-himitsu; a keen double-bladed naginata that also splits into two kodachi unleashing a swarm of petal blades that eviscerate foes in a slashing whirlwind. Though Tamiko is more than capable of striking foes from the shadows, sturdier enemies require her special brand of swordsmanship and petal-bladed combat. Since the rise of Leviathan in 2060 Sakura assassins have been employed by Magistor conducting impossible murders and espionage around the world. Kunoichi, and Sakura in particular, have proven time and again to be the best scapegoats for Leviathan's mandated assassinations. She also belongs to the Sasayaki Renmei, or Whispering Alliance, a league of assassins, hitmen, and other contract killers across the world. The Rakujochigusa clan throughout history have specialized in innovative blades incorporating new technologies into their weapons to accompany their trained warriors. The most recent innovation has been building a blade that incorporates neural interfacing technology into the weapon for a modern swarm-style of fighting. This has resulted in their newest innovation, a double-headed naginata called konohanasakuya-hime-no-himitsu (which was then shortened to konohana-no-himitsu), or The Blossom Princess' Secret. This versatile weapon functions as a twin bladed polearm to strike against multiple foes at length, or split into a pair of kodachi. However, instead of the blades splitting at the center of the handle, each blade has a smaller handle and the centerpiece erupts into a mass of flying petal shaped bladed microbots controlled remotely by the user's implanted neural interface. The source of a Sakura's strength is not the make of her blade, however, but rather the skill of its user. Tamiko was trained from a young age to be a master of physical strikes with precise blows and fluid movements to quickly defeat her foes. She specializes in diversionary tactics, allowing her to sneak about in the heat of battle by misleading foes with fast attacks and slick swordplay. While she can deal devastating damage with the heavier and longer reaching naginata form, Sakura often prefers to split her kodachi, and engulf enemies in a cloud of petal blades keeping their movements suppressed and confused while she is free to vanish and strike from another location on the field of battle. Incredibly advanced, the microbots themselves are the marriage of Haelan Nano-Technologies and Cyber Assemblies. Able to receive and deliver instantaneous commands due to a brain augmented implant, nanite bladed petals assault targets autonomously until given a different neural order. Despite their size, they are made from nearly indestructible Tritinium alloy and remain razor sharp. With a single thought Sakura can reform the naginata electromagnetically drawing both kodachi and the petal shaped microbots together as the center handle. Intricately layered together, the microbots are programmed to form a sheathe around the petal blades preventing damage to the user's hand. Switching between weapon forms takes roughly 2-4 seconds and can be done from up to fifty feet away without even touching it. Sakura is so well trained at using the konohana-no-himitsu that her ability to strike with its varied forms and dispersed microbots in between individual strikes is breathtaking to those who witness it (often the last thing they ever see). Remorseless in duty, performance with dignity, failure only in death: Sakura lives by these immortal words; her family codex drilled into her since birth. She is as hard and cold as the blade she uses, a tool of her employer until the contract is carried out. Outside of duty, she finds little use for words, only speaking when necessary to obtain her goals. Tamiko takes her job very seriously, which has bled into her off-duty life significantly. She has zero sense of humor and reviles attempts at idle chit chat. Recently she has attempted to build some camaraderie within Leviathan as her surrogate family, though most people attempting a conversation usually find it a one-sided situation. Extremely introverted, she tends to blend into shadows at gatherings and tries as often as possible to work alone. Attempts to vanish fails at times though, as her beauty tends to attract attention no matter how hard she tries to remain anonymous. Tamiko traces her family lineage back to the Edo period of Japan during the feudal period in the late-18th century. Her great ancestors Kayoko and Sayumi Rakujochigusa were twin sisters born of Gaku Rakujochigusa, an Iga ninja clan leader who had risen through the ranks to become a warrior of unbelievable prowess and skill. Orphaned as a boy following an Iga clan attack, Gaku was taken in and trained as a blacksmith under legendary sword maker, Shinzo Nakamura. Over the next ten years Gaku grew strong, and instantly took to metallurgy. As he progressed, his apprenticeship included ninjutsu and using the swords he would make. Hours a day he would practice until his hands were raw and bleeding from fighting and sparring. A seeker of knowledge, he refused to rest until he became a master of the eighteen, ninjutsu skills called Ninja Juhakkei (the eighteen disciplines). On his 18th birthday, he left Shinzo and embarked on his first mission as a ninja of the Iga clan. Time and again he proved his worth and took positions of authority quickly when other ninja died during attacks. Eventually, he rivaled every warrior in his clan and become reputed for his cunning and strategy, being sought throughout Japan as the assassin above all others. At the age of 30 he fell in love with Itsuko Hasegawa, another orphan and one of the few female ninjas in the clan. Time passed. Gaku and Itsuko were married and soon after she gave birth to Kayoko and Sayumi Rakujochigusa. After ten more years it became apparent that Itsuko would bear no more children. Wanting to ensure his name lived on, Gaku began training his daughters in the ninja arts making them both master blade smiths and warriors. By the age of 65 Gaku fell ill and turned over the clan to his daughters. A year later, on his deathbed he decreed that every girl born of his bloodline would keep the Rakajuchigusa name and be trained in the metal working and fighting arts. He dubbed his daughters the first Sakura. It was Kayoko and Sayumi that introduced leaving a solitary cherry blossom petal on victims as a calling card that a Sakura had conducted the kill. Little did they know that this tradition would become an iconic symbol to be feared more than 200 years later. Since that time, each Sakura has trained their first daughter, birthed or adopted, to take up the mantle when the mother either dies or is too old to perform their duties. Only first daughters are allowed to be Sakura assassins. Most other Rakujochigusa family members lead their own lives without knowledge of their legacy, or join the effort and learn to craft weapons and armor. Tamiko's great grandmother Emiko was born in 1990 and survived the Dead Days War using her skills to their fullest extent. Finding a niche in aiding political conspiracies she was instrumental as a contracted killer for the sasayaki renmei (Whispering Alliance). Dating their history back well over 300 years, the Whispering Alliance was a secret professional league of assassins, hitmen, and other contract killers across the world. While amassing great wealth from killing, Emiko gave birth to Tamiko's grandmother, Masako in 2022. 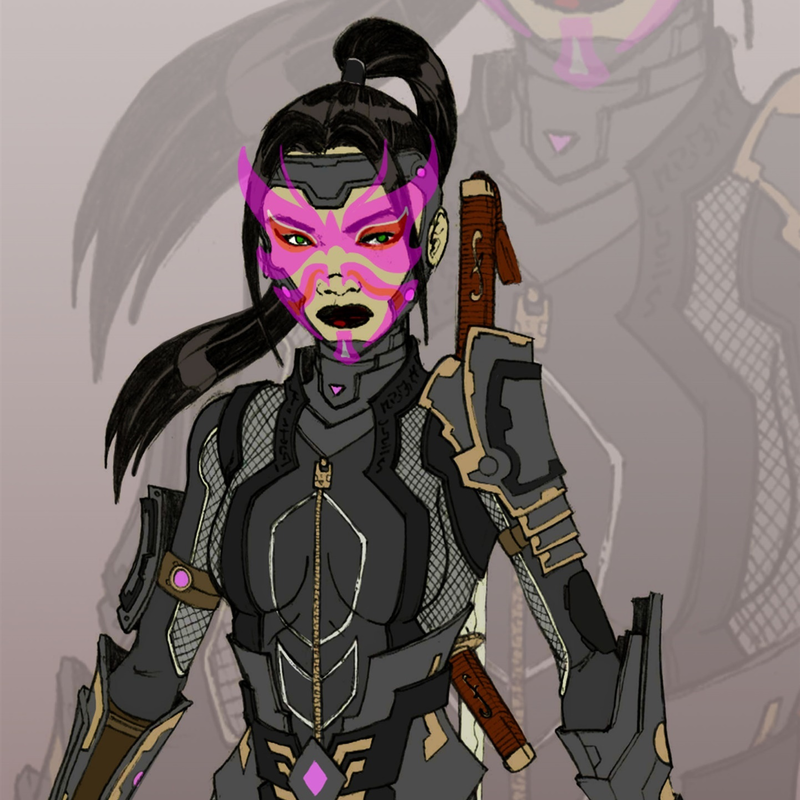 Masako became Sakura in 2048, while her younger brother Akira became employed at Predator Weapons Incorporated (PWI) carrying on the legacy of weapon makers. By 2053 Masako had four children, two boys Banri and Choki, and two girls Suzuko, and the eldest Rena, Tamiko's mother. From 2060 until 2071 Masako worked with Magistor to conduct surgical assassinations for Leviathan. While she continued being a contract killer into her 50's, her eldest daughter Rena was trained to be Sakura. Her sons followed education in technology and metallurgy with Banri going to work for Cyber Assemblies and Choki being employed at Haelan Nano-Technologies. With Masako's brother Akira, a senior partner at PWI, the Rakajuchigusa had a silent, yet prominent foothold in the business and technology world. By 2067 their combined genius would create the first konohana-no-himitsu. Rena ascended to be Sakura when Masako was killed in 2075 by Agent 53 during the Intergalactic War. She would live through the strife of aliens coming to Earth and fight tenaciously to keep her station as an assassin in the eyes of Leviathan, given the more technologically advanced and sinister methods of off-world killers. Tamiko was born in 2083 as an only child and adopted the family dynasty. She took over the role as Sakura at the age of 16 after her mother was killed on a task for Magistor. With a contract still unfulfilled, Tamiko took up the mantle and carried out the assassination with cold relentlessness. Her training and expertise with the konohana-no-himitsu easily carried out the job and she officially met Magistor to validate completion of the murder. She was accepted in place of her mother and began carrying out more contracts for Leviathan as needed, as well as answering calls from the sasayaki renmei. Like her predecessors, Sakura leaves a nakigoeshite hana, (or crying blossom) after each assassination. A single cherry blossom petal stuck above one of the victim's cuts to make it appear the blossom itself is weeping. Having to adapt to aliens and inorganic torsos, she leaves a cut elsewhere to draw fluid or, if none is found, the petal is left wedged in a deep gash to ensure it does not blow away. If there is no body to leave for a reason, the blossom is left in a pool of blood at the scene or simply where the target was killed if there was no blood. At the age of 20, and with family ties still at Cyber Assemblies and Haelan Nano-Technologies, Sakura's future seems bright despite living in the shadows.